And I got one last week too. So I decided to create a tutorial and a video on it. It will save me some time and help the readers too. Below is a video where I show how to highlight the active row and column in Excel. In case you prefer written instructions, below is a tutorial with exact steps on how to do it. Let me first show you what we are trying to achieve. In the above example, as soon as you select a cell, you can see that the row and column also get highlighted. This can be helpful when you’re working with a large dataset and can also be used in Excel Dashboards. Now let’s see how to create this functionality in Excel. Select the data set in which you to highlight the active row/column. Click on Conditional Formatting and then click on New Rule. In the New Formatting Rule dialog box, select “Use a formula to determine which cells to format”. Click on the Format button and specify the formatting (the color in which you want the row/column highlighted). The above steps have taken care of highlighting the active row and active column (with the same color) whenever there is a selection change event. However, to make this work, you need to place a simple VBA code in the backend. The above VBA code is run whenever there is a selection change in the worksheet. It forces the workbook to recalculate, which then forces the conditional formatting to highlight the active row and the active column. Normally (without any VBA code) a worksheet refreshes only when there is a change in it (such as data entry or edit). Also, an IF statement is used in the code to check if the user is trying to copy paste any data in the sheet. During copy paste, the application is not refreshed and it is allowed. Go to the Developer tab (can’t find the developer tab? – read this). In the VB Editor, on the left, you will see the project explorer that lists all the open workbooks and the worksheets in it. If you can’t see it, use the keyboard shortcut Control + R.
With your workbook, double-click on the sheet name in which you have the data. In this example, the data is in Sheet 1 and Sheet 2. In the code window, copy and paste the above VBA code. You’ll have to copy and paste the code for both sheets if you want this functionality in both sheets. 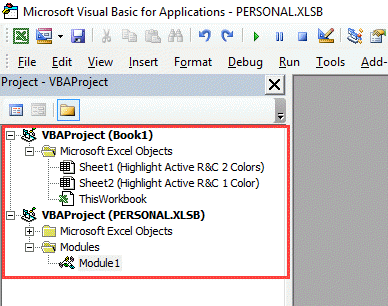 Since the workbook has VBA code in it, save it with a .XLSM extension. In the download file provided with this tutorial, I have created two tabs, one each for single color and dual color highlighting. Since these are two different formulas, you can specify two different colors. This method would not impact any formatting/highlighting you have done manually to the cells. Conditional formatting is volatile. If you use it on very large datasets, it may lead to a slow workbook. The VBA code used above would refresh the workbook every time there is a change in selection. CELL Function is available in Excel 2007 and above version for Windows and Excel 2011 and above for Mac. In case you’re using an older version, use this technique by Chandoo. Hi! How can I activate the undo and redo button? to force the screen to update, but I’m not sure why I had to do this. HI, I followed these tips exactly. But it does not work. I think my conditional formatting may be the issue. I have had similar challenges using CF in the past. This worked great for me. Just what I needed. Thank you! Nice of course, but a little more should be told. A little more efforts are needed if you intend to use it for highlighting different rows/columns in multiple workbooks/worksheets. The CELL function works on “Application level” – it provides information for the currently active cell (regardless of worksheet or workbook). For example if you apply this trick to sheet1 in workbook A, and then you edit cell C3 in workbook B row 3 and column C in workbook A sheet1 will be highlighted. Of course situations exist when this may be exactly what one needs. I thought it is good to mention this. I followed all the steps but no highlight is seen. The example file works for me even though it popped up an VB error, oddly only the 1st time when I opened it. I downloaded the excel example (and from what I can tell) – everything is the same. It’s still not working. I assume since saving as a .XLSM extension is not an option it’s set as a default?? Never mind – I read other comments and typed in everything manually. Works like a charm!! Thanks for sharing this. I only have a problem when i’m using 2 excel windows side by side. Because when I swicht to the other window the cell formating in the first window changes. I there any solution for this? Hi, it is not working for me, I have Office 365 and have enabled the macros copying all the details but nothing gets highlighted. Any idea what I’m doing wrong? Doesn’t work for me. VBA code is identical, conditional formatting is identical. It’s Excel 2016. Any suggestions? Is there a way to make this work with a dynamic selection ? I would like this to work after I paste in a new set of data/selection (The selection will have the same columns, but the rows varies. Hi, I loved this highlight, but I need to keep using the “COPY” and “PAST” function as numbers and formulas. It is possible? I am trying to use my spreadsheet with your modification. A problem I have found is that although I can copy a range of cells which are highlighted as normal, the paste function is greyed out. Ctrl+V also doesn’t work. Any ideas why? Maybe I should have read the instructions more carefully!! ;-)) I missed out the VBA code. Added it and now working brilliantly. Hi again, Just discovered that it works if I just select a cell and then press either page up or page down. 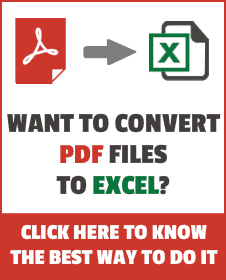 Hi Sumit, I have tried to introduce this trick into a spreadsheet using Excel 2016. I used the conditional format method without the macro. Is it necessary to write the macro as well? The only way I can get it to work is to select a cell, press F2, and then press enter. In your example it is not necessary to go the F2 then enter route. Is there an option setting I am missing? Something to do with automatic screen updating? is there a way to fix it? and make genera copy and paste work? Like the tip very much. but it is not working for me. i am using office 2010.
cells remain without highlight. cannot make out what’s wrong. great. after few hits and trial it worked. now to replicate it in all my worksheets??? any shortcuts or just copy the conditional formatting and vba to the other sheets. Thanks for the help – greatly appreciated. Hi Sumit, is there any way to apply this to all worksheets in a workbook? Also, how to make it easily applicable to a new workbook? Thanks – had to type it out myself (the quotations were the issue), works like a charm on my huge spreadsheets. to the VBA i have added some lines. Where do you add those lines?